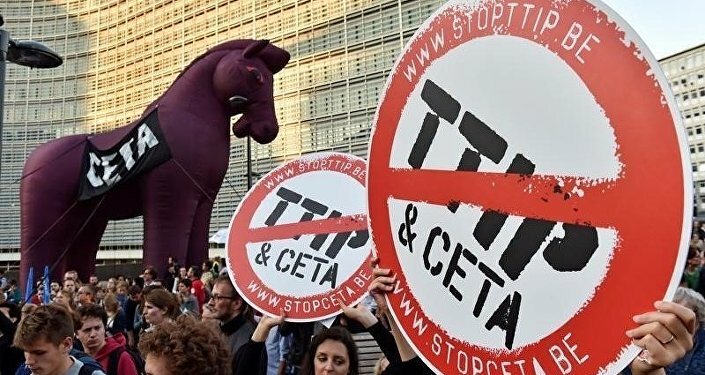 Dutch activists have gathered almost two-thirds of the signatures needed to initiate a national referendum on the EU-Canada free trade pact, also known as CETA (Comprehensive and Economic Trade Agreement). Campaign manager Arjen Nijeboer talked to Sputnik about the three main points of the pact that the activists are particularly concerned about. After seven years of negotiations the controversial free trade deal was signed in Brussels in late October. However, it still has to be ratified by the European Parliament as well as national and some regional parliaments of all 28 EU states. Meanwhile, over 190 thousand people, out of the 300 thousand needed, have already supported the petition calling for a public vote on the deal, recently signed by Ottawa and Brussels. The petition states that CETA is a threat to democracy, as it gives too much power to big companies and leads to major consequences for national labor, social, environmental, and consumer standards. If enacted, the CETA deal will remove almost all trade tariffs between the EU and Canada. Radio Sputnik sat down with Arjen Nijeboer, a campaign manager at "More Democracy", one of the organizations that started the petition that is calling for a referendum on CETA in the Netherlands, and asked him why his organization opposes this free trade deal. "Of course, there are good sides about CETA, but we are very worried about the democratic downside of the agreement. We are not anti-trade, we are not campaigning against the countries' trade with each other but against the way in which it is done," he explained to Sputnik. "CETA would introduce special arbitration courts that give rights to multinational companies to sue the government for billions of euros if the government introduces changes which might endanger these companies' profits," he said. The activist explained that this means that the governments will become "afraid to legislate." Secondly, he said, through CETA the European governments are accepting Canadian standards for labor, food, animal welfare and the environment, so they will give up the sovereignty of their own European standards. "Thirdly, we have a regulatory cooperation. So, CETA will install transnational bodies across the Atlantic that can enlarge the scope of CETA, with fairly little influence from parliaments," he told Sputnik, adding that these are the three main concerns the activists have. "It is not only about trade: CETA is much more than a trade treaty," he said. Arjen Nijeboer also explained that even though the referendum has only an advisory role, the political culture of the Netherlands is such that the Dutch government can't simply ignore such a vote, even if it is not binding. "We also had a referendum on the treaty between the EU and Ukraine," he recalled. "It was the test case. And the government still has not ratified this treaty and will probably only do so when the Netherlands get special guarantees. And if these guarantees do not come, the Netherlands will not approve of the agreement," he stated. The activist also said that he is pretty sure that they will be able to get enough signatories for triggering a public vote. CETA: How Free is Free Trade?